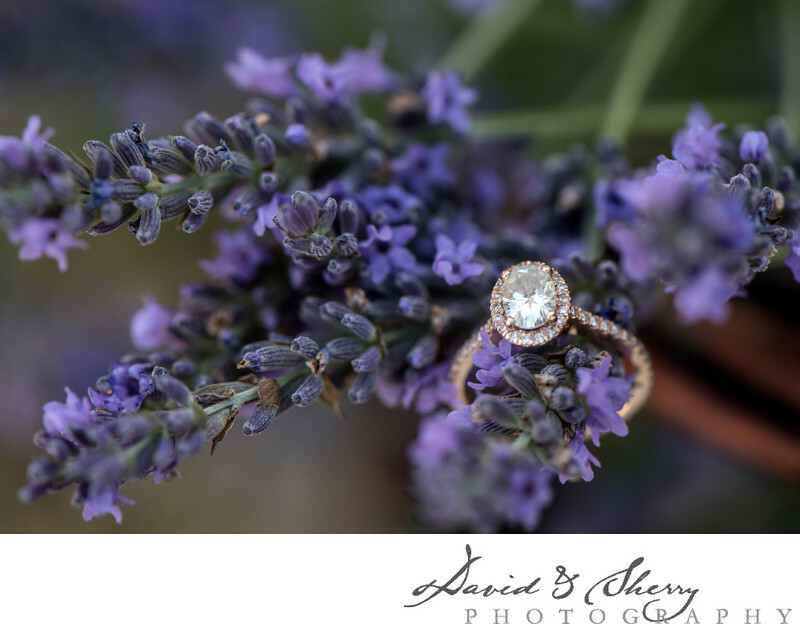 The Terre Bleu Lavender is the perfect place to take engagement photos. It offers something unique as it is the only operational lavender farm in Ontario and it is very near Toronto. This farm has become a very popular spot to get pre-wedding photos taken and during the time of year when the flowers are in bloom it is challenging to book a time to come take pictures but if you do get a slot they are some of the most friendly people you'll meet. The owners are dedicated to providing a Canadian source of lavender which is more commonly grown in Italy and though our climate offers it's challenges they have succeeded in creating a beautiful space perfect for pictures. The have trails throughout the property, an indoor space with boilers and hanging dried flowers as well as the iconic purple rows which line the fields. In this picture we have taken the engagement ring and have hung it on one of the flowering plants and taken our 105mm macro lens from Nikon and gotten in really close in order to get all the details of the beautiful diamond set in rose gold. We can't wait until the next time we photograph here. Location: 2501 25 Side Rd, Campbellville, ON L0P 1B0.